Historically, willow bark (Salix spp.) has been one of the most widely used anti-inflammatory botanicals, primarily for the treatment of arthritic symptoms. 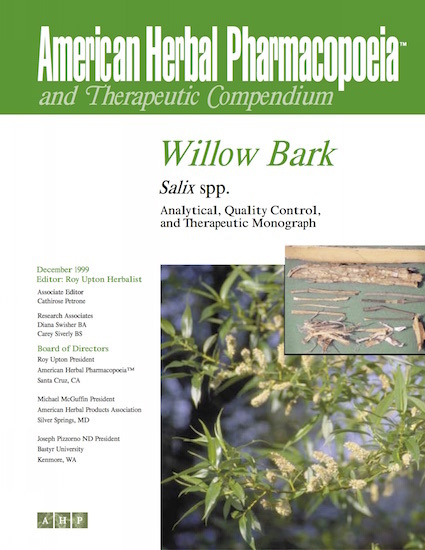 The bark of several willow species is a rich source of salicin, the precursor to aspirin. There are numerous species of willow that have been traded historically as Salicis cortex. Unfortunately, in popular literature, “white willow bark” is the name most commonly used. Because of this, there is a belief that willow bark should be derived exclusively from Salix alba (white willow), when Salix alba is one of the lowest sources of salicin among several species. Specifications should be developed to include several species versus only those species that are accepted in popular and authoritative literature. There has been concern raised that willow bark may cause blood thinning in the same way that aspirin does. This is unfounded and fully addressed in the AHP monograph.